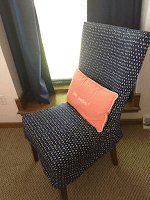 I often am surprised by what can be created with leftover fabric. This pillow cover was made from some new-ish leftovers and some very old ones. 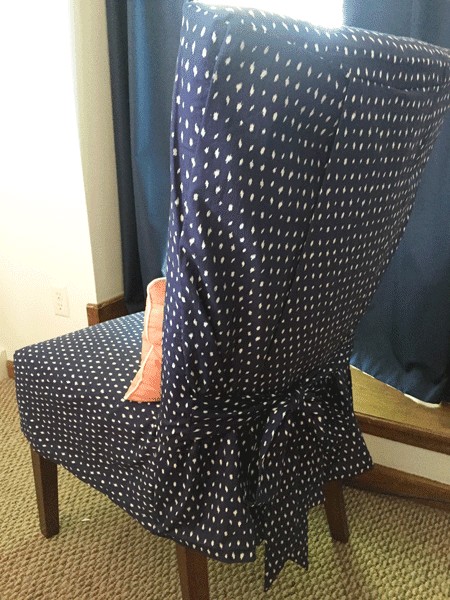 You might remember seeing a chair that was waiting to be slipcovered in my studio reveal post. I began with a tutorial, How to Sew a Parsons Chair Cover and added a few variations. I am really happy with the results. The partner chair has a slipcover I bought at Target, and it shifts every time I sit in the chair. My custom slipcover doesn't shift at all. Since I bought extra fabric, I had a good sized piece left over, plus some scraps that will be used for a small quilt top. It had been my plan to also make a pillow top. 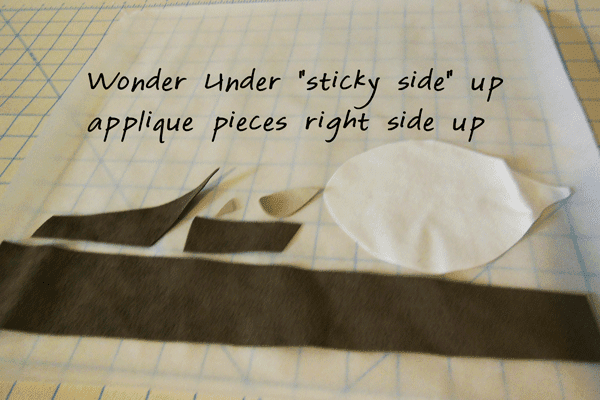 This might be a good time to talk about options for applique. Not everyone has scraps of Ultrasuede around, but there are other good choices. 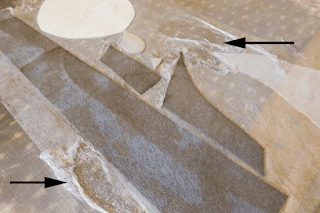 You could use felt, which like the Ultrasuede does not ravel. You could use other imitation suede, or baby corduroy, or woven cottons, or lightweight knits. If you use a fabric that ravels, you would probably want to stitch it on with a nice satin stitch, but you could also use a zigzag or blanket stitch for a more rustic look. Once I had all my pieces cut and arranged. I applied Wonder Under to them so that I would be able to iron them on to the pillow top and they wouldn't shift while I was stitching. You could pin your pieces in place, but I wanted it to be really secure. I put the Wonder Under (I used heavy duty because that's what was handy.) on my ironing surface with the webbing side up. Then I placed my applique pieces on top, right sides up. Then I placed a non-stick ironing sheet on top of that and pressed each piece well. My plan was that I could then flip it all over and peel off the applique pieces, but it didn't work out that simply. I suspect that the heavy duty Wonder Under was the main reason, but this would be a good time to explain that ordinarily one would iron the Wonder Under to a piece of fabric, then cut out the applique shapes. It took a few minutes to get my pieces cleaned up. I finally used my Silhouette scraper (You could use an old credit card if this ever happens to you.) 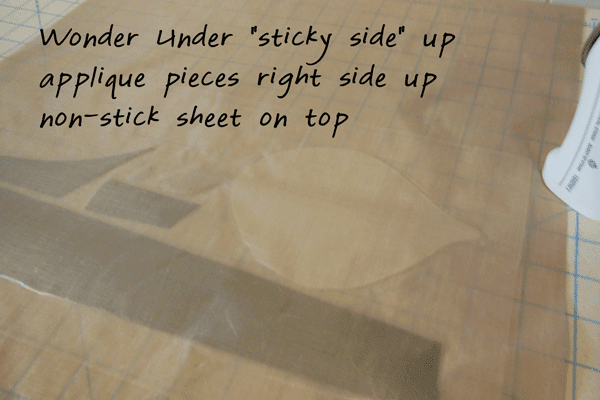 to scrape the Wonder Under off the non-stick sheet in the areas where there was no fabric. I carefully peeled up each applique piece and trimmed any excess fusible from the edges. 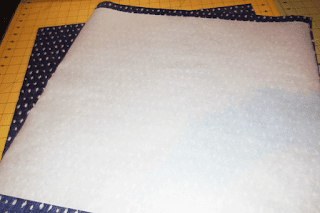 Before applying the applique pieces to the base fabric, I ironed a piece of freezer paper to the wrong side. 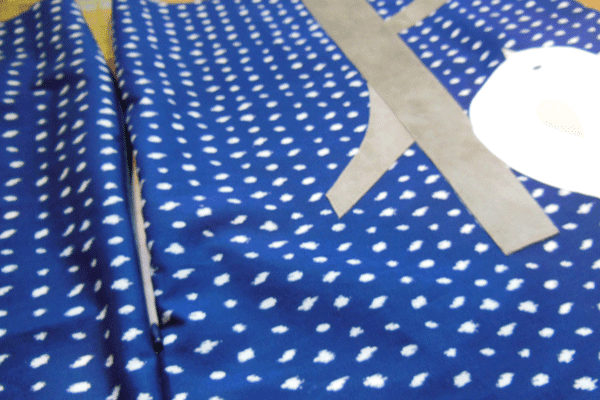 This gives stability while stitching and helps to keep the base fabric from stretching as you turn it during sewing. You can buy freezer paper at the grocery store; it's an inexpensive sewing accessory. 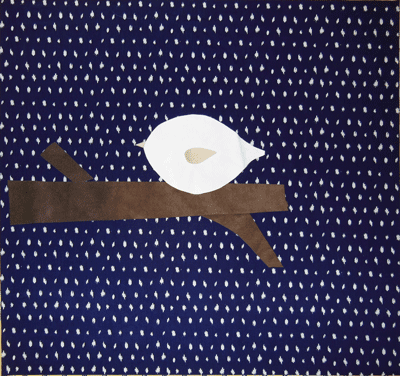 After applying the freezer paper, I flipped the fabric over and placed my applique pieces. 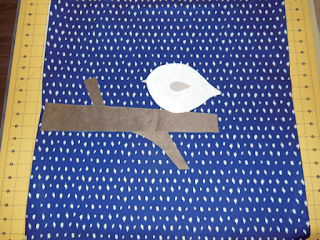 Then I used a canvas press cloth and pressed all the pieces in place. Now I was ready to sew! I used a simple straight stitch lengthened to about 3mm and regular sewing thread, then stitched close to the edge of each piece. 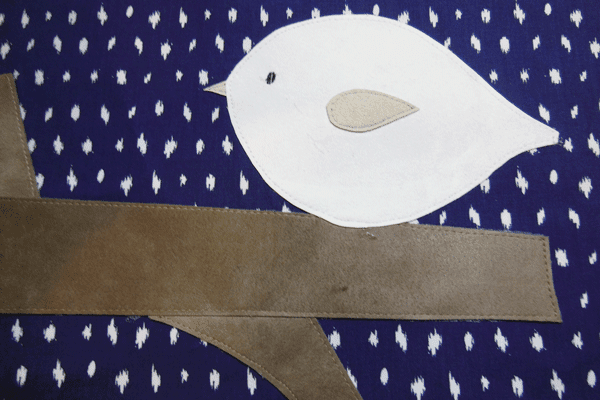 You can see here that I probably should have left the bird off until I had the branch stitched, but I just skipped over the bird's body and trimmed the thread later. 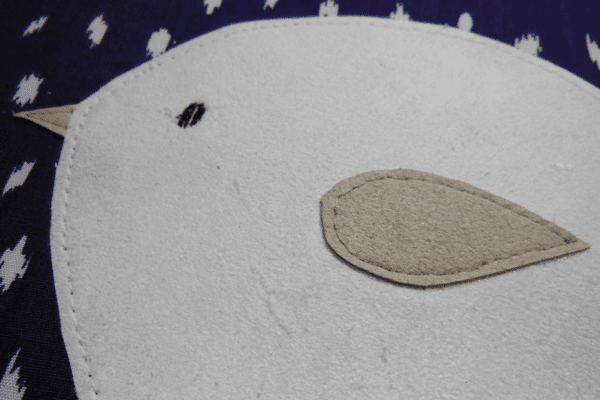 After stitching on all the pieces, I used a special stitch on my sewing machine to give the bird an eye. 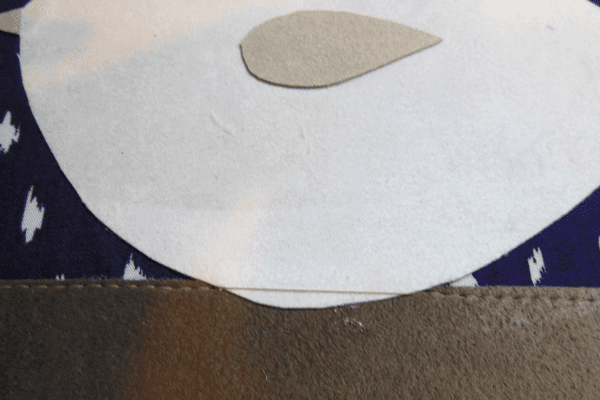 You could hand stitch the eye, or use a tiny button. I then carefully removed the freezer paper from the wrong side. It helps to run a fingernail or straight pin along the stitching lines so that pulling the freezer paper away doesn't pull at the stitches. Now it's time to make the pillow cover. 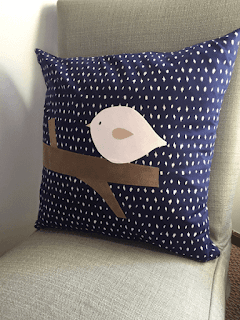 I decided to use a zipper to make this a true (removable) pillow cover. Adding a zipper costs a little more and takes a little time, but it saves a lot of hand stitching! I inserted an invisible zipper at the bottom of the pillow cover top. The top is sewn to one side of the zipper and the pillow cover back is sewn to the other side of the zipper. 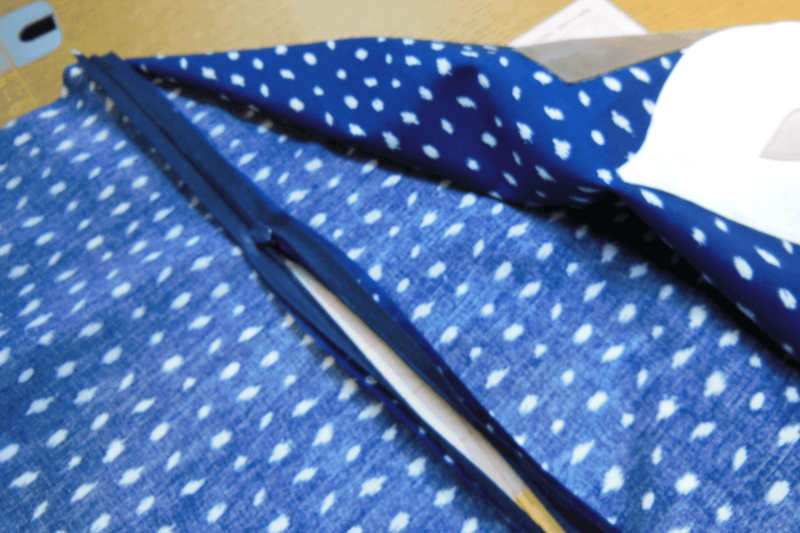 After sewing in the zipper, open the zipper before the next step. Now, using the zipper as a fold line, I placed the front and back right sides together and pinned. 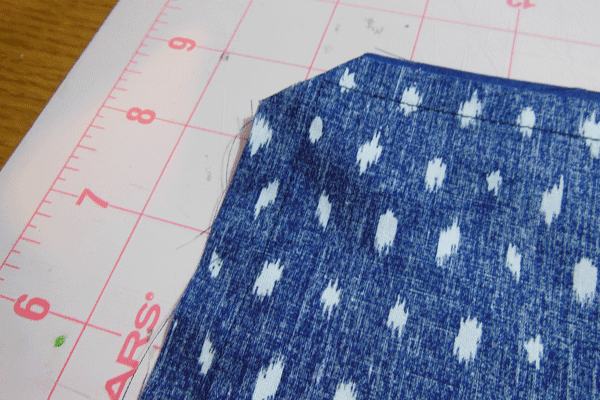 Then I sewed around the remaining three sides using a regular stitch and 1/2 inch seam. After sewing, I trimmed the corners and turned the cover right side out. All that was left was to insert the pillow! 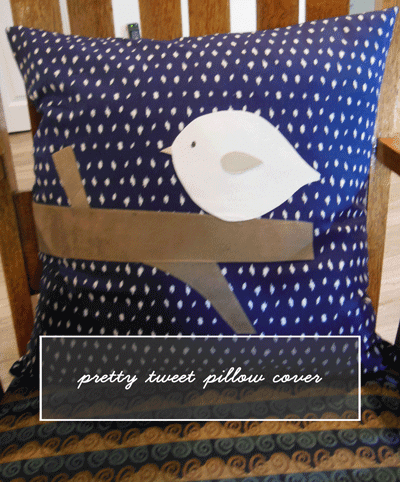 Isn't this pillow the Tweetest Thing? I'm really happy with how it turned out. 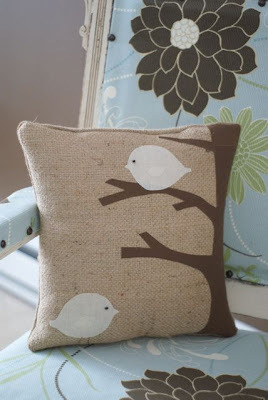 I hope that this tutorial inspires you to sew something sweet, you never know what might your scraps might hatch! Be sure to leave me a comment! Sew happy!